Summer sun generously gives us a sense of celebration, beauty and youth – all that we have lacked throu all the Ural long winter. We suggest you save the day with the help of tanning ! 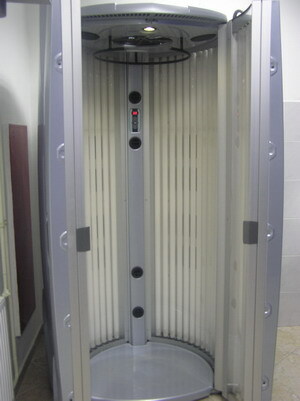 The principle of operation is to tanning by ultraviolet rays irradiated by influencing the pigmentation of the skin. Solarium is perfect not only because it gives our skin a nice bronze color, but also with the help of tanning can achieve a good cosmetic and therapeutic and prophylactic effect . If you can not imagine a good holiday without warm sea and sandy beach, solarium will help prepare your skin for sunbathing – this tan will keep much longer. Our vertical solarium made ​​in France.